Ford F-150s are for hauling, working, and towing, right? What about as a racing pace vehicle for this Sunday’s NASCAR Sprint Cup race? At first glance one would think that a 2013 Ford F-150 4X4 would be a bad pick as a pace car for the Michigan NASCAR Sprint Cup race this Sunday. After all, pace cars are supposed to be fast sports cars like Mustang Shelby GT500s, Chevy Corvettes, or 2013 SRT Vipers, right? On the contrary, pace vehicles are advertisements. Ford is very smart to put the Ford F-150 on the track and on the screen this Sunday. Here is why. Ford and other manufacturers don’t really race to improve their cars and trucks. That is a wonderful side effect, but the reason they race is to sell more cars and trucks. A recent study of NASCAR fans took a close look at the most common vehicles owned and driven by NASCAR fans and can you guess which vehicle was number one? If you guessed the Ford F-150 you would be correct. The second and third most driven vehicles by NASCAR fans are the Chevy Silverado and the Dodge Ram truck. The Toyota Tacoma also made the list. Overwhelmingly NASCAR fans choose trucks as their personal rides. From the grandstand and on TV it will be hard to see the new features that the 2013 Ford F-150 can come outfitted with. 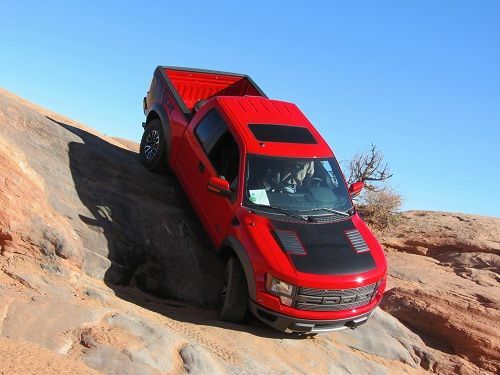 The standard descent control now on the SVT Raptor may not be needed, and hopefully Mr. Fields won’t be using the SYNC with MyFord Touch system to navigate or make calls. However, the bold new grill will be apparent. The new HID headlamps may also be visible. In conclusion, Ford’s using the new F-150 4X4 as a pace car is not a crazy move, but rather, marketing genius. I didn't see whether it will be the EcoBoost, but I assume so. That engine could push this truck to set a good pace anyway.